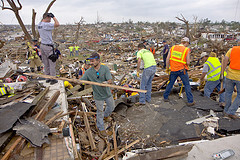 It’s been ten months since an EF5 tornado hit Joplin, MO, where we live. (We moved back here in June.) The city is still recovering, but even though there’s still a long way to go, a lot of progress has been made, in large part because of the thousands of volunteers who have given time to help. It’s spring break now, and workers are coming in from all over the country. Since May 22, help has come from outside the US, as well: For instance, after the Joplin school district announced its plans to provide Joplin high schoolers with MacBooks, the United Arab Emirates decided to donate $500,000 to help pay for them—with an additional pledge of another half-million dollars in the form of matching funds for the laptop program. You are currently reading Joplin, Missouri, USA, World at Clearing Customs.